The Marble Caves are located on Lake General Carrera/Buenos Aires (Depends which side of the lake you are on) Patagonia, Chile, the boat tours usually leave from Puerto Tranquillo (a little town), Rio Ibanez. 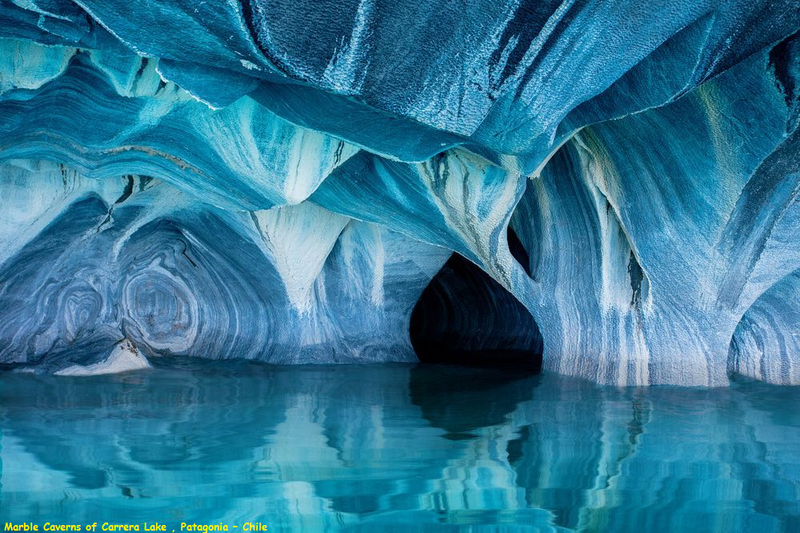 The amazing vibrant blue and grey cave chambers, (submerged to some extent) all lay in memorizing turquoise waters of Carrera/B.A Lake.The caves are on the Chilean side of the lake. the Chapel (La Capilla), the Cathedral (El Catedral), and the Cave (La Cueva). It is a unique geological formation featuring a group of caverns, tunnels and pillars created in monoliths of marble and formed by waves over the last 6,000 years or so. You can travel in a small boat or kayak, (only when the weather is nice and the water is mostly still).